IMPORTANT E-MAIL DELIVERY INFORMATION: In order to view our newsletters in their entirety, please add our email address, news@johnshopkins.6cp.com, to your Contact List, Safe List or Address Book. This action should also ensure eDiabetes Review emails go directly to your Inbox. Please do not reply to this email. To change/update your email address, please email us at info@dkbmed.com. Management of type 2 diabetes has evolved rapidly in the last few years. 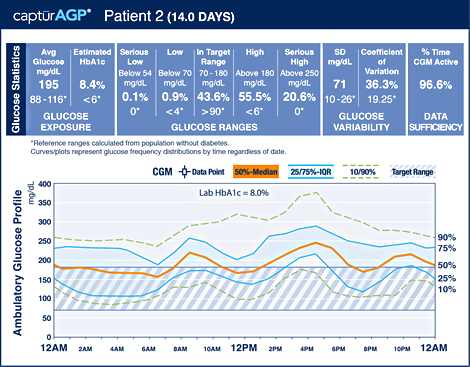 While HbA1c, a marker of average glucose over the past few months, remains the test by which we assess a patient’s glucose control, it does not give us comprehensive information about that person’s day-to-day glucose patterns. Continuous glucose monitoring (CGM) technology has become an important tool (upwards of 288 blood glucose readings per day, compared to the usual two to three readings by a finger stick) and is now being used more in type 2 diabetes. In this issue, Dr. Anders Carlson from the International Diabetes Center reviews recent publications describing the current use of CGM, how it may be more informative than HbA1c in certain situations, and the data regarding CGM use in type 2 diabetes. Identify the limits of HbA1c and the potential role for glucose data by continuous glucose monitoring (CGM) in type 2 diabetes. Describe the current evidence supporting the use of CGM in type 2 diabetes, including indications for use and potential benefits. Discuss the importance of a systematic approach to interpreting CGM data and using it in the clinical setting, including both retrospective and real-time data interpretations. Dr. Carlson has indicated that he has served as a principal investigator for Medtronic, Inc., and Novo Nordisk. He has served as a subinvestigator for Johnson and Johnson and received consulting fees from Merck and Sanofi. Dr. Carlson has indicated that there will be no references to unlabeled or unapproved uses of drugs or products. We are entering an exhilarating new era in diabetes management. We’ve seen exciting new pharmaceuticals, new forms of insulin analogs, and major breakthroughs in technology. One of the most promising advances in technology is continuous glucose monitoring (CGM). Although the technique has been in clinical use for nearly 20 years, only recently have CGM devices been accurate enough to drive automated insulin delivery, require few if any self-monitoring of blood glucose (SMBG) checks, and be approved and reimbursed for use in a broader diabetes population.1-3 Several forms of CGMs are on the market now; we have both ”professional” and “personal” CGMs, meaning either the clinic or patient owns the device, respectively. Some CGMs have “real-time” alarms for both low and high blood glucose, and others that have a simpler design and do not alarm. Intermittent scan or “flash” glucose monitoring is now approved in the US, and these factory calibrated devices require no routine SMBG checks and operate by “flashing” a small receiver over a sensor placed in the upper arm measures glucose every minute. Altogether, these devices are challenging the current way we collect, visualize, and respond to glucose data. It should be no surprise that HbA1c, long held as the gold standard metric for glucose control, is not without flaws. While useful as an average for a population, on an individual level, HbA1c does not always show the granular detail of a patient’s day-to-day experience living with diabetes. For instance, the research by Kesavadev et al (reviewed herein) found that 38% of type 2 diabetes (T2D) patients (most of whom were insulin-requiring) had hypoglycemia, with > 50% of that overnight, a shocking finding that underscores the need for better understanding of glycemia in these patients (it is worth noting that the CGM used here may not be as accurate at 80 mg/dL or lower). As reviewed in this issue, CGM data can complement HbA1c data and can even improve HbA1c outcomes while reducing the amount of both hypoglycemia and hyperglycemia. 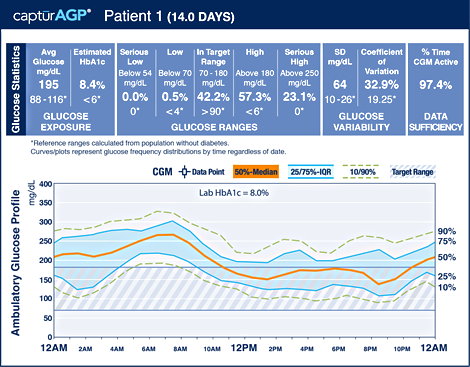 While it is exciting to think that CGM could replace SMBG and provide a much more comprehensive view of patient data, how clinicians and patients use and react to that data will become crucial. With so much data at our fingertips, recent publications have called for standardization of CGM data definitions, visualization, interpretation, and documentation. 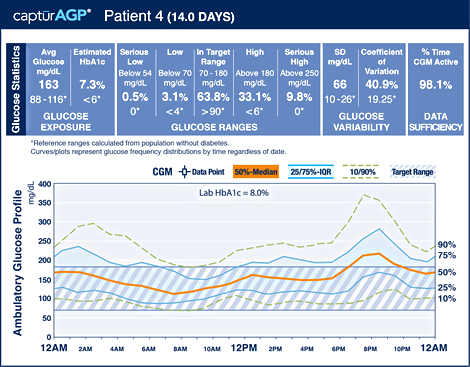 The AGP (ambulatory glucose profile) is becoming the universal standard for glucose interpretation.10 An AGP report will show glucose metrics such as time spent in certain glucose ranges and daily CGM tracings, as well as a graph with all the included days' data shown together by time, allowing easy visualization of patterns such as hypoglycemia, hyperglycemia, and variability. The AGP is simple yet chock-full of data, and one can foresee its being used as a tool for research and also for shared decision making one-on-one with patients. Taken together, I think CGM is appropriate in patients with T2D who are at risk for hypoglycemia, in whom SMBG is impractical or not preferred, or for those who are motivated and capable of using such a device to optimize their goals. CGM is especially helpful if combined with a structured education/lifestyle program and can help change patient behaviors.11,12 This issue presents some of the most recent data on CGM use in T2D. Studies are discordant about how CGM can benefit a T2D population, with Haak et al noting improvements in hypoglycemia and Beck et al showing improvements in hyperglycemia. Further, not all studies use structured patient education or aggressive therapeutic titration, which are paramount to successful diabetes management, thus necessitating further research. Much remains to be known about CGM in T2D (cost-effectiveness, appropriate populations, duration of use, need for alarms, patient satisfaction, readiness to adopt, etc); however, the window into CGM use in T2D is becoming clearer, and to date the data are cautiously promising. With both clinicians and patients becoming more familiar with using and interpreting CGM data, and with promising new therapeutic choices, I think we will see a new era driven by personalized approaches to therapy to help people with T2D live better lives. Bergenstal RM, Garg S, Weinzimer SA,et al. Safety of a hybrid closed-loop insulin delivery system in patients with type 1 diabetes. JAMA. 2016 Oct 4;316(13):1407-1408. Aleppo G, Ruedy KJ, Riddlesworth TD et al; REPLACE-BG Study Group. REPLACE-BG: a randomized trial comparing continuous glucose monitoring with and without routine blood glucose monitoring in adults with well-controlled type 1 diabetes. Diabetes Care. 2017 Apr;40(4):538-545. Klonoff DC, Buckingham B, Christiansen JS, et al; Endocrine Society. Continuous glucose monitoring: an endocrine society clinical practice guideline. J Clin Endocrinol Metab. 2011 Oct;96(10):2968-79. Juvenile Diabetes Research Foundation Continuous Glucose Monitoring Study Group. Effectiveness of continuous glucose monitoring in a clinical care environment: evidence from the Juvenile Diabetes Research Foundation continuous glucose monitoring (JDRF-CGM) trial. Diabetes Care. 2010 Jan;33(1):17-22..
Beck RW, Riddlesworth TD, Ruedy K, et al; DIAMOND Study Group. Effect of continuous glucose monitoring on glycemic control in adults with type 1 diabetes using insulin injections: the DIAMOND randomized clinical trial. JAMA. 2017 Jan 24;317(4):371-378. Carlson AL, Mullen DM, Bergenstal RM. Clinical use of continuous glucose monitoring in adults with type 2 diabetes. Diabetes Technol Ther. 2017 May;19(S2):S4-S11. Vigersky R, Shrivastav M. Role of continuous glucose monitoring for type 2 in diabetes management and research. J Diabetes Complications. 2017 Jan;31(1):280-287. American Diabetes Association. Professional Practice Committee: Standards of Medical Care in Diabetes—2018. Diabetes Care. 2018 Jan;41(Suppl 1):S3. Peters AL, Ahmann AJ, Battelino T, et al. Diabetes technology—continuous subcutaneous insulin infusion therapy and continuous glucose monitoring in adults: an endocrine society clinical practice guideline. J Clin Endocrinol Metab. 2016 Nov;101(11):3922-3937. Bergenstal RM, Ahmann AJ, Bailey T, et al. 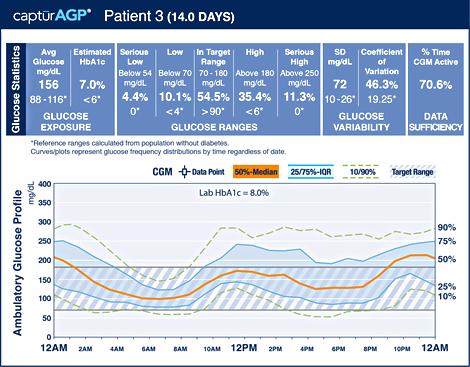 Recommendations for standardizing glucose reporting and analysis to optimize clinical decision making in diabetes: the Ambulatory Glucose Profile (AGP). Diabetes Technol Ther. 2013 Mar;15(3):198-211. Cox DJ, Taylor AG, Moncrief M, et al. Continuous glucose monitoring in the self-management of type 2 diabetes: a paradigm shift. Diabetes Care. 2016 May;39(5):e71-73. Vigersky RA, Fonda SJ, Chellappa M, Walker MS, Ehrhardt NM. Short-and long-term effects of real-time continuous glucose monitoring in patients with type 2 diabetes. Diabetes Care. 2012 Jan;35(1):32-38. Most clinicians who are active in clinical diabetes practice have frequently observed instances where the HbA1c does not correspond well with a patient’s observed glucose patterns by either SMBG or self-reporting. Indeed, HbA1c, a metric of mean blood glucose over a two- to three-month period, has been known for decades to reflect a wide range of mean blood glucose levels.1,2 Factors that may explain the differences in the relationship between HbA1c and mean glucose include race, disorders of red blood cell lifespan (such as hemolytic anemia, cirrhosis, end stage renal disease), and hemoglobinopathies.3,4 The advancement of newer technologies, such as CGM and intermittent or flash scan monitoring, now gives clinicians an additional tool to assess glycemic control. This perspective report, while not a randomized controlled trial, is important and timely for sounding the alarm on the “fallacy” of relying on HbA1c alone. HbA1c clearly has a role for population and large-scale comparison studies, not to mention its association with risk for complications;5 however many experts are now calling for measurements beyond HbA1c to manage individual patients. In this report, the authors present data from three recently completed RCTs (studies included patients with both T1D and T2D) using Dexcom G4 CGM technology. By pooling CGM and HbA1c data for 387 subjects (age range 20-78 years, with nearly 20% having T2D), they compared CGM-based estimated mean glucose concentrations against observed HbA1c. Up to 13 weeks of CGM data (median of 66 days of data) were used to determine the mean glucose. Alarming, though not surprising, is the enormous range of mean glucose concentrations for a given HbA1c. For example, an observed HbA1c of 8% corresponded to a mean glucose concentration estimate of anywhere from 155 mg/dL-218 mg/dL. The mean glucose average range for 7% was equally broad at 128 mg/dL-190 mg/dL, and also for 9% 182 mg/dL-249 mg/dL. Therefore, the confidence intervals for the mean glucose corresponding to 8% remarkably overlap with 7% and 9%. In essence, this means a measured HbA1c of 8% in any individual could reflect anything from “favorable” to “not as favorable” glycemic control. To illustrate their point, the authors present four ambulatory glucose profiles (AGP), a standardized method of reporting glucose data,6 from patients all having a lab-measured HbA1c of 8.0%. (See figures below) Each pattern of CGM data over 14 days is remarkably different, and all would dictate different treatment interventions. Instead of relying solely on HbA1c, CGM-based mean glucose concentrations can complement and tailor the treatment regimen on a personal level. Indeed, the authors suggest that even a one-time CGM analysis compared to the HbA1c should be robust and durable enough to show the clinician that the HbA1c may be inappropriate for that patient’s glucose patterns for the future. It is notable that HbA1c is the basis often used to judge treatment interventions, health care systems, and even individual clinicians; this could be misguided if interpreted in isolation. While the authors do not specify the optimal method, frequency or interpretation of CGM data, it is clear— based on these findings as well as other expert opinions — that we are witnessing a shift from relying solely on HbA1c to a more sophisticated, personalized system that factors in each patient’s unique glucose patterns. Although we are moving “beyond HbA1c,” we do have much more progress to make in determining upon which CGM-based glucose metrics we should rely. Yudkin JS1, Forrest RD, Jackson CA, Ryle AJ, Davie S, Gould BJ. Unexplained variability of glycated haemoglobin in non-diabetic subjects not related to glycaemia. Diabetologia. 1990 Apr;33(4):208-215. Wright LA, Hirsch IB. Metrics beyond hemoglobin A1c in diabetes management: time in range, hypoglycemia, and other parameters. Diabetes Technol Ther. 2017 May;19(S2):S16-S26. Danese E, Montagnana M, Salvagno GL, Lippi G. Can we still trust hemoglobin A1c in all situations? Clin Chem Lab Med. 2017 Oct 26;55(11):e241-e242. Bergenstal RM, Gal RL, Connor CG, et al; T1D Exchange Racial Differences Study Group. Racial differences in the relationship of glucose concentrations and hemoglobin A1c levels. Ann Intern Med. 2017 Jul 18;167(2):95-102. Stratton IM, Adler AI, Neil HA, et al. Association of glycaemia with macrovascular and microvascular complications of type 2 diabetes (UKPDS 35): prospective observational study. BMJ. 2000 Aug 12;321(7258):405-412. Kesavadev J, Vigersky R, Shin J, et al. Assessing the therapeutic utility of professional continuous glucose monitoring in type 2 Diabetes across various therapies: A retrospective evaluation. Adv Ther. 2017 Aug;34(8):1918-1927. Although — intuitively — CGM benefits in T2D should parallel those seen in T1D, few studies are available to confirm such benefits in type 2.1 Moreover, because 80%-90% of all T2D care is provided in the primary care setting,2 any intervention using CGM in T2D should be readily applicable to both specialty and primary care. Past studies have shown benefit to using CGM both periodically (worn for just a few weeks) and retrospectively (patients do not see their real-time glucose data) in T2D,3,4 although those studies relied on older CGM technology and few included patients on multiple daily injections of insulin. Kesavadev et al here present some new data using six to seven days of CGM readings from an iPro2 professional (blinded, retrospective) CGM device (Medtronic, Minneapolis). This retrospective analysis at a large diabetes center in India sought to show if a one-time professional CGM analysis followed by education and treatment adjustment would improve HbA1c at six months. Over a four-year period, the investigators identified 296 adults with T2D on different therapies (insulin, GLP-1RA, and/or oral agents). These 296 patients were matched against 296 patients in the control group who did not undergo CGM analysis. Of note, the routine care which both groups received did include a remote Diabetes Tele Management System, which has an emphasis on shared decision making.5 The CGM data were used to highlight problematic areas (eg, hypo- or hyperglycemia) and guide therapy changes. Baseline therapies included insulin with oral agents in 91% of patients; 7% were on oral agents only and 2% on glucagon-like peptide-1 receptor agonists (GLP-1 RA) only. The CGM data revealed hyperglycemia (at least 30 minutes > 180 mg/dL) in about 45% of patients, with hypoglycemia (at least 30 minutes < 70 mg/dL) noted in an alarming 38% of patients (58% of that hypoglycemia was nocturnal, whereas almost all the hyperglycemia was postprandial). HbA1c in the CGM group decreased from 7.5 ± 1.4% at baseline to 7.0 ± 0.9% at 6 months (P = .0001). The control group saw a reduction from 7.7 ± 1.1% to 7.4% ± 1.0% at 6 months (P = .0593). The group seeing the largest benefit of CGM intervention were patients on basal-bolus or biphasic insulin, as well as those on insulin pumps. Changes were made in pharmacotherapy in 99.3% of patients after the CGM intervention, and the authors observed no specific therapy change that seemed to improve HbA1c more than others. Although retrospective data, this study demonstrates the potential impact of a single professional CGM analysis coupled with a structured management program focused on shared decision making and how that can have a strong impact on glycemic control. It is notable that virtually every patient had a medication adjustment following the CGM analysis. Further, although iPro2 and FreeStyle Libre Pro are less sensitive in hypoglycemia ranges and therefore may limit interpretation of hypoglycemia data using these devices,6,7 it is worth noting the nearly 40% of patients with baseline hypoglycemia underscores the often overlooked amount of hypoglycemia seen in T2D patients. Since hypoglycemia events can cost upwards of $10,000 per episode and are a major limit to tighter glycemic control,8,9 the ability for CGM to mitigate hypoglycemia in T2D needs further attention. Unfortunately, in this study no CGM was done at six months to compare amounts of hypo- and hyperglycemia. Finally, it is provocative to think that a relatively simple, inexpensive intervention using just one professional CGM analysis followed by close follow-up and structured education and titration could provide durable HbA1c reduction to this magnitude. Saudek CD. The role of primary care professionals in managing diabetes. Clin Diabetes. 2002 Apr; 20(2): 65-66. Leinung M, Nardacci E, Patel N, Bettadahalli S, Paika K, Thompson S. Benefits of short-term professional continuous glucose monitoring in clinical practice. Diabetes Technol Ther. 2013 Sep;15(9):744-747. Inzucchi SE, Bergenstal RM, Buse JB,et al. Management of hyperglycemia in type 2 diabetes, 2015: a patient-centered approach: update to a position statement of the American Diabetes Association and the European Association for the Study of Diabetes. Diabetes Care. 2015 Jan;38(1):140-149.
iPro ® 2 with Enlite sensor User Guide - Medtronic Diabetes. Available at: https://www.medtronicdiabetes.com/sites/default/files/library/download-library/user-guides/iPro2-with-Enlite-User-Guide.pdf. Accessed May 9, 2018. Ólafsdóttir AF, Attvall S, Sandgren U, et al. A clinical trial of the accuracy and treatment experience of the flash glucose monitor freestyle libre in adults with type 1 diabetes. Diabetes Technol Ther. 2017 Mar;19(3):164-172. Haak T, Hanaire H, Ajjan R, Hermanns N, Riveline JP, Rayman G. Use of flash glucose-sensing technology for 12 months as a replacement for blood glucose monitoring in insulin-treated type 2 diabetes. Diabetes Ther. 2017 Jun;8(3):573-586. The use of intermittent scan (also called flash) glucose monitoring technology in T2D is emerging as a promising alternative to the reliance on SMBG. 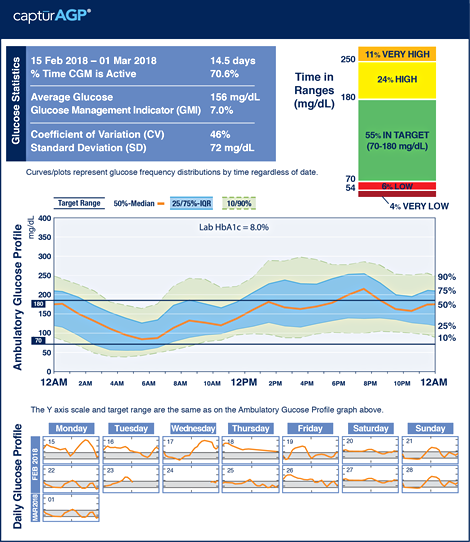 Useful for both therapy titration and behavior/lifestyle adjustments, the need for some form of monitoring glucose is crucial, although SMBG use has been limited due to the nature of its method (eg, finger stick blood sample) and cost. Flash glucose monitoring, which is factory calibrated and does not require routine SMBG, has become a new player in the field of glucose monitoring with the entrance of the FreeStyle Libre system (Abbott, Chicago). This study adds to the previously published results of the REPLACE study.1 The first REPLACE study was a six-month, open-label, randomized controlled trial from 26 European centers that randomized adults with T2D on intensive insulin therapy to flash glucose monitoring using the FreeStyle Libre system (n = 149) vs a control group using only SMBG (n = 75). Those randomized to the flash system received no formal training on how to interpret their glucose data. After six months, those randomized to flash glucose monitoring demonstrated a similar and (nonsignificant) slight reduction in HbA1c (primary outcome). However, with regard to hypoglycemia and time in range, those using flash glucose monitoring saw a significant reduction in time spent in hypoglycemia: time < 70 mg/dL was reduced by 0.47 ± 0.13 hr/day (P = .0006) and < 55 mg/dL was reduced by 0.22 ± 0.07 hr/day compared to SMBG (P = .0014). This translates to a 43% and 53% reduction from baseline, respectively. There were no differences between groups for time in range (70 mg/dL-180 mg/dL) or time in hyperglycemia, suggesting the main advantage is in reducing hypoglycemia. Further, the use of flash glucose monitoring essentially obviated the need for SMBG in the treatment group, from a mean of 3.8 tests/day before the study, to mean of 0.3 tests/day at the end. The study reviewed here is the six-month continuation data for those randomized to the flash system in the REPLACE study; 139 of the treatment group continued into an open-access phase. Rather than HbA1c as the primary outcome, the outcomes in this continuation study were sensor-derived metrics. Time in hypoglycemia (< 70 mg/dL and < 55 mg/dL) showed further benefits, 50% and 62% reductions from baseline, respectively (both P = .0002). The number of hypoglycemic events was also reduced, including a 62% reduction in events with a glucose < 45 mg/dL (P = .0002). Again, no change in time in range or time in hyperglycemia was noted. Note that for both studies, the main adverse effect of the device was skin reaction at the sensor site. Taken together, these two studies of the REPLACE program demonstrate that flash glucose monitoring is as effective as SMBG, and potentially superior with regard to time in hypoglycemia. While the time in range (70 mg/dL-180 mg/dL) and time hyperglycemic are not different, the opportunity for few to no SMBG checks is appealing to many patients with T2D. Certainly the 12-month data here suggest durability of its use, noting the ongoing frequency of flashes and high participation at one year. While the tradeoff may be risk of skin reactions to the adhesive, many patients will view flash glucose monitoring as a welcome alternative to SMBG. The REPLACE program was successful at keeping a real-world approach; there was no structured training and no insulin titration algorithm, and visits were every three months. It remains to be seen how using flash glucose data as part of a structured education program, aggressive medication titration plan, or alternative care delivery program could expand upon the reduction in hypoglycemia. It is also worth noting that at the baseline of the REPLACE study, subjects were having over one hour of hypoglycemia per day, underscoring that hypoglycemia is not unique to type 1 diabetes, and CGM may help reduce that risk. Haak T, Hanaire H, Ajjan R, Hermanns N, Riveline JP, Rayman G. Flash glucose-sensing technology as a replacement for blood glucose monitoring for the management of insulin-treated type 2 diabetes: a multicenter, open-label randomized controlled trial. Diabetes Ther. 2017 Feb;8(1):55-73. Beck RW, Riddlesworth TD, Ruedy K, et al; DIAMOND Study Group. Continuous glucose monitoring versus usual care in patients with type 2 diabetes receiving multiple daily insulin injections: A randomized trial. Ann Intern Med. 2017 Sep 19;167(6):365-374. In the current study of T2D patients not meeting HbA1c goals, 158 adult patients (age 35 to 79, mean 60 ± 10 years) were randomized to CGM (n = 79) or usual care (n = 79). CGM in this setting was the Dexcom G4 Platinum system (San Diego), which provides real-time glucose measurements as often as every five minutes (as well as glucose trends and low/high glucose alerts). The usual care group was asked to check SMBG at least four times per day. Insulin dose adjustments were not specified for either group and were done at the investigators’ discretion. Conducted at 25 sites in North America, this 24-week randomized controlled study recruited patients with T2D having HbA1c levels of 7.5% to 10.0%, on stable treatment with MDI insulin, and performing SMBG at least two times/day. Patients completed a two-week, blinded CGM during run-in to demonstrate > 85% CGM wear time. The CGM group received general CGM education and how to incorporate CGM and glucose patterns into their management. The usual care group underwent blinded CGM at weeks 12 and 24 for comparison. HbA1c was measured at 12 and 24 weeks. The primary outcome was change in HbA1c over 24 weeks. From a baseline mean HbA1c of 8.5% in both groups, the CGM group decreased to 7.7% compared to 8.0% in the control group, accounting for a -0.3% adjusted difference (P = .022). Additional prespecified secondary HbA1c outcomes favored CGM but were not statistically significant. Hypoglycemia episodes were low at baseline (11 minutes per day in CGM group vs 12 minutes per day in the control group), so the primary benefit of CGM appears to be less time in hyperglycemia – unlike T1D studies, where CGM reduced time in hypoglycemia. There were no severe hypoglycemia episodes in either group, nor was there any change in hypoglycemia awareness. Also notable is that the CGM group wore the CGM on average 6.7 days/week and maintained similar rates throughout the entire six-month study, suggesting that a T2D population would find CGM data meaningful over long periods of treatment. This study is one of the first to demonstrate a role for personal, real-time CGM use in patients with T2D. Although the reduction in HbA1c was modest, this was a more real-world study, with few visits and no prescribed insulin titration. Coupled with a more aggressive education and insulin titration algorithm, the HbA1c difference may have been larger. Moreover, improvements were consistently seen in subgroup analyses regardless of age, education, HbA1c level, or diabetes numeracy, suggesting potential for CGM in a broad T2D population. Satisfaction and quality of life scores did not differ between groups. Beck RW, Riddlesworth TD, Ruedy K, et al; DIAMOND Study Group.Effect of continuous glucose monitoring on glycemic control in adults with type 1 diabetes using insulin injections: the DIAMOND randomized clinical trial. JAMA. 2017 Jan 24;317(4):371-378. Danne T, Nimri R, Battelino T, et al. International consensus on use of continuous glucose monitoring. Diabetes Care. 2017 Dec;40(12):1631-1640. This paper serves as a guidepost for “where we go beyond HbA1c.” By summarizing the February 2017 Advanced Technologies and Treatments for Diabetes (ATTD) congress expert panel of physicians, researchers, and people with diabetes, this statement builds on previous calls for relying on glucose monitoring to guide glycemic targets and mitigate hypo- and hyperglycemia. Here the panel builds the case for using CGM in practice and research, as well as outlining the metrics on which CGM data should be based. This statement outlines seven topics germane to CGM use (both real-time and intermittent CGM). Starting with the limits of HbA1c (as Beck et al describe in this issue) and how to assess the accuracy of CGM systems, the panel moves on to highlight in whom CGM is beneficial. They acknowledge the paucity of data regarding CGM in T2D, recommending that CGM be considered in patients with T2D treated with intensive insulin therapy who are not achieving glycemic targets, especially if they are affected by frequent or severe hypoglycemia. For clinical practice as well as in research, the panel sought to clearly define hypoglycemia. Level 3 (severe hypoglycemia, with cognitive impairment requiring assistance from another person for recovery; note there is no specified glucose value). Clinically, these levels are significant in the sense that in level 1, the patient should be alerted for risk of worsening hypoglycemia and work to limit time in this range. Conversely, level 2 hypoglycemia should prompt the patient to take immediate action. The frequency and duration of each of these levels of hypoglycemia can be used not only to personalize patient care but also as useful outcomes in research. This consensus report helps us sort through the massive amount of data we receive with CGM. Compared to 21-28 SMBG readings/week, with CGM we can get nearly 2000 or more data points to analyze. Standards to study and compare therapeutic approaches are needed, but such details will be immensely important for patient care as well, and with more education and awareness, patients hopefully will begin to more routinely view and react to their own data. Temelkova-Kurktschiev TS1, Koehler C, Henkel E, Leonhardt W, Fuecker K, Hanefeld M. Postchallenge plasma glucose and glycemic spikes are more strongly associated with atherosclerosis than fasting glucose or HbA1c level. Diabetes Care. 2000 Dec;23(12):1830-1834. Esposito K, Giugliano D, Nappo F, Marfella R; Campanian Postprandial Hyperglycemia Study Group. Regression of carotid atherosclerosis by control of postprandial hyperglycemia in type 2 diabetes mellitus. Circulation. 2004 Jul 13;110(2):214-219. Eslami S1, Taherzadeh Z, Schultz MJ, Abu-Hanna A. Glucose variability measures and their effect on mortality: a systematic review. Intensive Care Med. 2011 Apr;37(4):583-593. Fonseca V, Grunberger G. Letter to the Editor. Endocr Pract. 2017 May;23(5):629-632. Buckingham BA, Close KL, Bergenstal RM, Danne T, Grunberger G, Kowalski AJ, Peters A, Heller SR (2017). Reaching an international consensus on standardizing continuous glucose monitoring (cgm) outcomes―aligning clinicians, researchers, patients, and regulators. American Diabetes Association 77th Scientific Meeting, San Diego, California. A continuing body of evidence supports CGM as useful in managing type 2 diabetes. While HbA1c is a good marker of average glucose for a population, CGM may provide a more robust assessment of an individual’s glycemic patterns. Standardization of CGM data, along with education for both clinicians and patients may help improve type 2 diabetes management in both specialty and primary care settings. eNewsletter: The Johns Hopkins University School of Medicine designates this enduring material for a maximum of 1.0 AMA PRA Category 1 Credit™. Physicians should claim only the credit commensurate with the extent of their participation in the activity. eNewsletter: This 1.0 contact hour Educational Activity is provided by the Institute for Johns Hopkins Nursing. Each Newsletter carries a maximum of 1.0 contact hour, or a total of 6 contact hours for the 6 newsletters in this program. All rights reserved - The Johns Hopkins University School of Medicine. Copyright 2018.